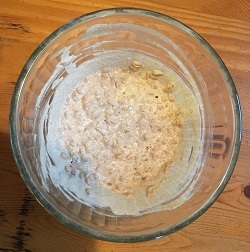 In a bowl, stir together and leave covered on the counter overnight: oats, quinoa flour, nut milk, and apple cider vinegar. Stir the olive oil and vanilla into the soaked oats and quinoa. In a mixing bowl, stir the dry ingredients together. Warm up some coconut oil in the skillet over medium heat. Gently stir the wet ingredients into the dry ingredients. Do not overstir or you could deactivate the baking soda, which provides the rising action. Saute your pancakes, adding more oil as needed. You know it's time to flip them when bubbles form across the top. Adjust the heat as needed so as not to overcook. Serve with your favorite toppings. We like fresh fruit or berries for sweet and nuts for protein. In the winter, I heat frozen fruit or berries up with some water and cinnamon to make an unsweetened syrup. Dave likes to top with yoghurt, but for dairy-free, you could use cashew cream (google it!). These pancakes have a nice cakey texture! Soaking the grains makes the nutrients more available and digestible. If you eat dairy, you can substitute 1/2 cup yoghurt for the nut milk and apple cider vinegar.